Over 90 per cent of the world population lives in countries that share a river basin with others. Freshwater resources are scarce and different nations, actors and users compete for limited resources in transboundary river basins; often conflicting with each other. Water is a resource with no substitute: it cannot be secured in sufficiently large quantities through long-distance trade deals; and, due to the interconnectivity of the hydrological system, the actions of one country in its water management have a direct bearing on the interests of neighbouring countries. For instance, in the Mekong River Basin, current hydropower and navigation developments in certain countries impact on traditional sources of income such as fisheries, and rice production in others. These kinds of changes in water use have given rise to conflict between countries in that region and others, but have also led, in some cases, to greater cooperation. The past few decades have seen a number of new agreements about the sharing of river resources and cooperation between riparian states. 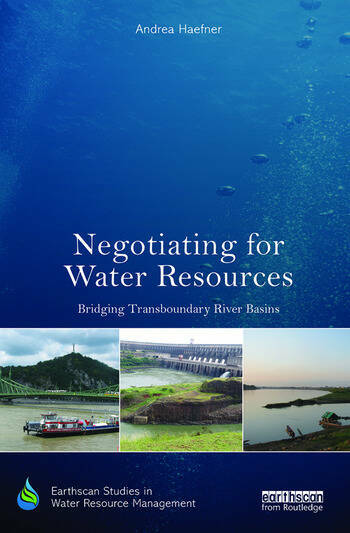 Negotiating for Water Resources explores the drivers of conflict and cooperation between states in transnational river basins. Drawing on extensive fieldwork and interviews on the Mekong, Danube and La Plata River Basins, the book provides a three level analysis across three case studies, including the regional framework (EU, ASEAN and Mercosur), the River Basin Organisations (ICPDR, MRC and CIC) and the micro-level. The key question of the book is: To what extent do power asymmetries prevent or inhibit cooperation between riparian states over water resources? This is linked to the question of how institutions contribute to mitigate competition for natural resources and how states interact in a multilateral arena. Overall, the book argues that cooperation in transboundary river basins is possible even where there are asymmetric power relations, challenging realist assumptions about competition and conflict over resources. Chapter 4: Danube River: The Leading Example? Andrea Haefner is an Adjunct Research Fellow at the Griffith Asia Institute in Brisbane, Australia, where she also received her PhD. She has previously worked with international and national organisations in Asia and with the German local government. Her research focuses on non-traditional security issues focusing on environmental security and water governance.